04.12.19Jason Miles CelebratingThe Music of Weather Report 4/12/19 Berks Jazz Festival Reading PA.
09.08.18Michael Franks Sept. Events 9/2/18 Atlanta Ga. 9/22/18 New Haven CT.
Mike Stern Guitar, Teymur Phell, Bass Me Drums Edmond Gilmore Bass Weds. Show. 08.13.17Valery Ponomarev Quintet Sun. 8/13/17 5 PM at The Multicultural Arts Exchange Philadelphia PA.
And a host of of other musicians and speakers honoring Kim Plainfield. VP Big Band all of the above plus an additional cast of thousands! Valery Ponomarev Tpt Director, Me Drums, Ruslan Khain Bass, Mamiko Watanabe Piano, and a host of others. The Valery Ponomarev (trumpet) Big Band playing the music of Art Blakey. Featuring Peter Furlan Sax, Neil Alexander Kybds, Ratzo Harris Bass, Me Drums. Featuring Peter Furlan Sax, Neil Alexander Kys, Ratzo Harris Bass, Me Drums playing the music of Weather Report, Herbie Hancock, and original music. Featuring Mike Stern Guitar, Teymur Phel Bass, Me Drums. Mike Stern Guitar, Teymur Phell Bass, Me Drums. 08.29.15Appearing with "Kind of New" at The Hudson Valley Jazz Festival, Sat. 8/29/15 7:30 PM Warwick N.Y. Performing at the Railroad Green Warwick NY. 08.08.15Appearing with The Mike Stern Band at The Litchfield Jazz Festival Saturday 8/8/15 7:45PM Goshen Ct.
02.20.15Appearing with The David Bass Trio 2/20/15 8:00 PM The Narrows Center for The Arts Fall River Mass. 1/5/15 Featuring Mike Stern Guitar, Tom Kennedy Bass, Me Drums. Featuring Mike Stern Guitar, Teymur Phel Bass, Me Drums. Get an early start to your New Year's Eve festivities! Operatic sensation Lina Orfanos sings the American Songbook, featuring Spiros Exaras Guitar MD, Gary Schreiner Harmonica, Piano, Accordion, Essiet Essiet Bass, Me Drums. 07.01.14 The 80th Anniversary Issue of Downbeat Magazine Article. "The 80 Coolest Things in Jazz Today." A tribute to the music of Weather Report. 11/20/13 The Jazz Kitchen Indianapolis Ind. Featuring Lynn Stein Vocals, Warren Vache Cornet, James Chirillo Guitar, Me Drums. 11/20-25/13 The Jazz Showcase, Chicago Ill.
11.15.12Hudson Valley Musicians & Poets for Hurricane Sandy Relief 11/15/12 7-10:30 PM Sugar Loaf Performing Arts Center 1351 Kings Highway, Sugar Loaf N.Y. Featuring Joe Lovano, Jeff Ciampa, Mark Egan, Me, Jason Miles, Neil Alexander, Judi Silvano, Jon Werking, , and a host of other musicians and poets from the Hudson Valley area. $15 admission. All proceeds go to Hurricane Sandy Relief. 05.25.12Paul Rose "Blues" Recording Project English Guitarist Extraordinaire 5/28/12-6/8/12 Steakhouse Studio No. Hollywood CA. Featuring Paul Rose Guitar Kenny Hutchison Bass, Me Drums Randy Jacobs guitar, and Tio Banks keyboards of Was Not Was. Vocalists: Bernard Fowler singer with The Rolling Stones, Sweet Pea Atkinson singer with Lyle Lovett, Bonnie Raitt, Terry Evans singer with Ry Cooder.Raffia Ford singer with P Diddy. Maximum Blues and R&B. Look for an October release. Grammy Award winning Latin Jazz Flutist. Featuring Bill Oconnell Piano, Richie Flores Conga, Ruben Rodriguez Bass, Me Drums. Featuring Bill Oconnell, Piano, Lincoln Goines Bass, Me Drums. 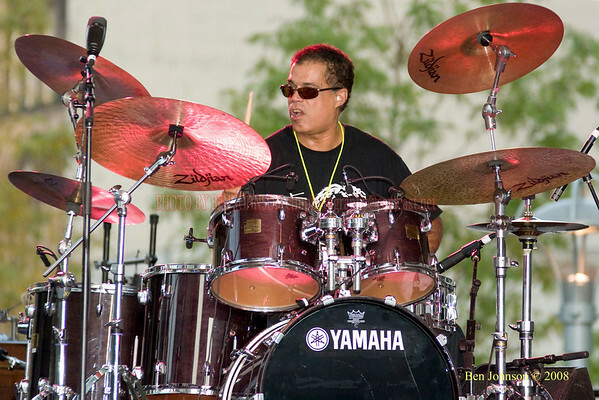 Drum instructor at Purchase Summer Jazz Institute PSJI ages 14-18. Purchase College Conservatory of Music SUNY Purchase N.Y. Appearing at The NV Lounge Suffern NY. Jazzy Funk, Funky Jazz. Appearing at Yamaha Groove Night in Monterey Mexico with the Yamaha Drum roster of All Stars. Jay Azzolina Group featuring Gary Versace Organ, Tim Ries Sax, and myself. Concert Dates in Russia, Lithuania, and Croatia with one of my favorite electric bassists of Weather Report, Steps Ahead, and Madonna fame just to name a few. Hittin' it in Bella Italia. 09.04.06A blast from the past!